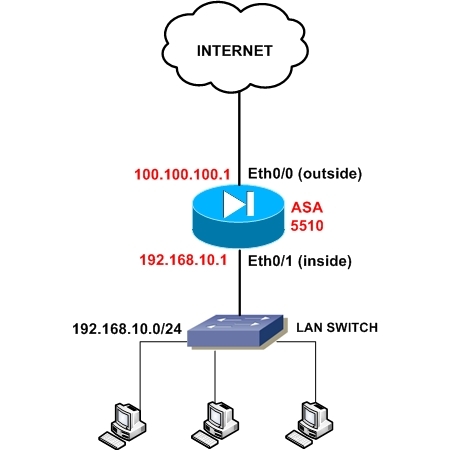 This article gets back to the basics regarding Cisco ASA firewalls. I’m offering you here a basic configuration tutorial for the Cisco ASA 5510 security appliance. This device is the second model in the ASA series (ASA 5505, 5510, 5520 etc) and is fairly popular since is intended for small to medium enterprises. Like the smallest ASA 5505 model, the 5510 comes with two license options: The Base license and the Security Plus license. The second one (security plus) provides some performance and hardware enhancements over the base license, such as 130,000 Maximum firewall connections (instead of 50,000), 100 Maximum VLANs (instead of 50), Failover Redundancy, etc. Also, the security plus license enables two of the five firewall network ports to work as 10/100/1000 instead of only 10/100. Next we will see a simple Internet Access scenario which will help us to understand the basic steps needed to setup an ASA 5510. Assume that we are assigned a static public IP address 100.100.100.1 from our ISP. Also, the internal LAN network belongs to subnet 192.168.10.0/24. Interface Ethernet0/0 will be connected to the outside (towards the ISP), and Ethernet0/1 will be connected to the Inside LAN switch. Refer to the diagram below for our example scenario. The above basic configuration is just the beginning for making the appliance operational. There are many more configuration features that you need to implement to increase the security of your network, such as Static and Dynamic NAT, Access Control Lists to control traffic flow, DMZ zones, VPN etc. I just tried to offer you a starting point for a basic configuration from where you can build your knowledge further. So are you doing an "permit ip any any" on both inside and outside interface? I noticed you don't mention any ACLs besides the NAT. resan. Simple theme. Powered by Blogger.